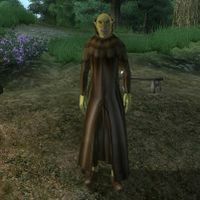 Mor gra-Gamorn is an Orc nightblade who is a devout worshipper of the Daedric prince Nocturnal, and can be found with her two fellow worshippers, Francine Velain and Dhola, at Nocturnal's Shrine. Mor gra-Gamorn is a devout worshipper of Nocturnal. She spends all of her time wandering around the shrine, never stopping to eat or sleep. A believer in night and darkness, Mor is not keen on strangers passing by and will only say: "What is your business in this place?" And she will proceed to question you for the purpose of your presence: "You should not be in this place. What is your business here? Do you believe yourself worthy to speak to Nocturnal?" If you tell her you are just passing by she will say: "Then leave, and forget you have ever seen this place." If you confirm that you want to approach the shrine, she will point you towards the small stone bridge leading to Nocturnal with the words: "Perhaps you have been summoned. Perhaps Nocturnal desires your service, and has guided you here. Approach." And she will add: "Approach the shrine, if you dare." She wields an iron dagger and wears a monk robe with a pair of clogs. She only carries a small amount of gold. Mor knows a leveled set of nightblade spells, as well as one extra major Alteration spell. Nocturnal: Recover the Eye of Nocturnal from a pair of thieves in Leyawiin. This page was last modified on 4 January 2019, at 03:48.